Sample letter to ask your subordinates/colleagues to complete the assigned task and submit report. Letter to the Section Officer to Complete the Work and Give Reports. Warning Letter to Submit Report to Employee. Letter regarding submission of report. I hope you are doing well in health. This letter is to inform you about the deadline of the work. We have given the Road Project analysis report (work) to you last week and wanted you to submit that within a week, but you have not submitted that to us till now. Please kindly complete your work till tomorrow and submit us the report about the project so that we can send this to Project head. We will be thankful to you. Daily Production Report Format in excel for companies, Production units of textile, paper mills and printers. 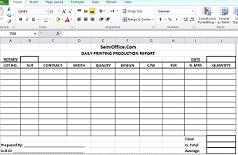 The Daily Production Report Samples are available in excel and word formats for free download. 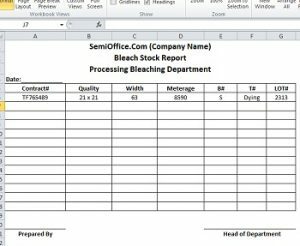 This production report template includes LOT number, Contract Types, Width of Production, quality, Design and length of the final production. This format is taken from textile production unit of a multinational firm. She can recognize numbers from 1-100. She can tell spellings of numbers from 1-10. She can do addition and subtraction of two digits. She can tell, shorter, longer, bigger, thicker, thinner, lightest, heaviest, nearest, and fastest. She has the concept of before, after, and between. She has the concept of time. She can match letter to letter from a-z. She can recognize alphabets from a-z. She can tell about action pictures like sleeping, jumping, cycling, crying etc. She can sight read her name. She can sight read 26 printed words. She can recognize basic shapes i.e. circle, square, triangle. She can complete the words by telling the missing letter. She can use “this” and “these” in sentences. She has the concept of ‘behind’. She can make sentences by matching parts of sentences. She can match words and sentences with pictures. She can sight read 12 printed words. She has achieved all the goals of PGEE. According to her teacher, she was friendly and cooperative with teachers and class fellows. She performs her task with concentration. She takes interest in her studies. She responds to questions by blinking her eyes and by moving her head. Tightness of bilateral Tendon achilis,hamstrings ,hip abductors, and restriction of hip flexion at end ranges.